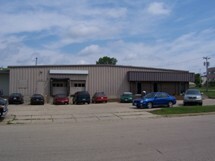 The property consists of two single story steel and concrete block buildings which are joined together by two 10' by 14' enclosed walkways with overhead doors. There are four drive up loading docks and one drive-in door. It is currently divided into mixed uses containing approx 8,600 sq ft of air conditioned commercial studio space, three separate office areas containing approx 3,671 sq ft and approx 24,500 sq ft of warehouse space. Terms and conditions of this offer are subject to change.